England U20—kids out of school, probably in pink, taking ‘selfies’ on the half way line. Oh No! Watch that space and apologise for a gross misconception. The women wearing the Red Rose were skilled, fast, strong and very tough. 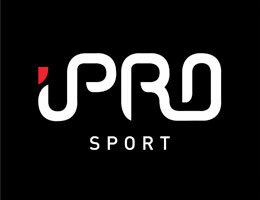 Their organization was amazing after being together for a short time and there are future World Cup stars in this mix. The game opened at pace and stayed on that plateau throughout. The set pieces were pretty even. Ding met Dong and the Army scored two good tries. Winger Jade Mullan ran in almost unopposed after very slick hands whilst fly half Amy Robinson crashed over—neither converted. England scored a brace through a gem from full back Rachel Lund and Olivia Jones. Sarah Nicholson kicked the penalty to make it Army 10 pts England U20 13. 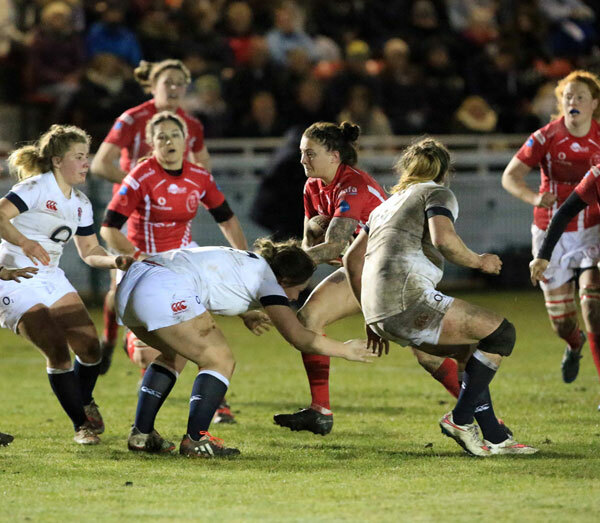 The second half saw England deservedly stretch their lead to 20 pts-10 but the Army were never out of the running. 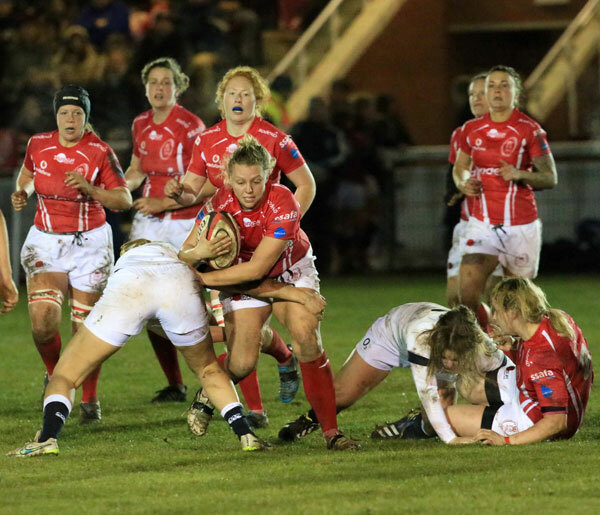 The final try might have gone either way as the Army got the upper hand in the scrums and Rosie Haigh led her cohorts to batter the line. England stood firm—very firm as these U20s tackled like combined harvesters. 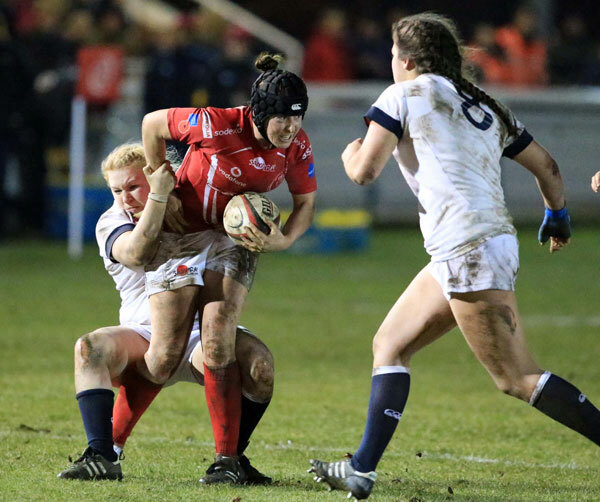 Stand-out player was England scrum half Caity Mattinson whist the U20 coaching staff nominated full back Rachel Lund who scored the sort of try you want to watch time and again on replay. 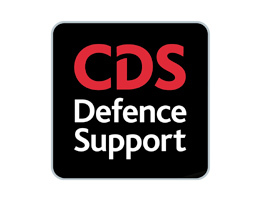 The Army played a strong brand of rugby against fierce opposition.Former England flanker Jane Leonard pulled the strings from scrum half, the pack thundered and the backs clicked into upper gears. A few passes too many went astray at vital moments and Army coach Capt Glyn Barraclough had every reason to be well pleased “with where we are in the season”. This was the first time the Army had welcomed an international XV to Aldershot. It was truly a memorable ‘first’ and we wish England U20 the best of good fortune in their forthcoming matches against France. 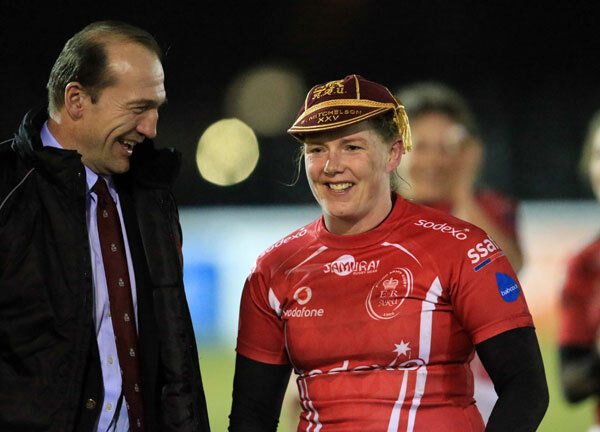 The evening was alsomemorable in that Sarah Mitchelson was awarded her 25th Army Cap by Army chairman Brig Will Bramble. An unkind ‘stats-wallah’ converted that into years—it didn’t show Sarah and very well done.